As is the case with any extended crisis, the Wisconsin stalemate has begun to create its own vernacular. Previously familiar terms and phrases are used in foreign contexts. Words garner new meaning. 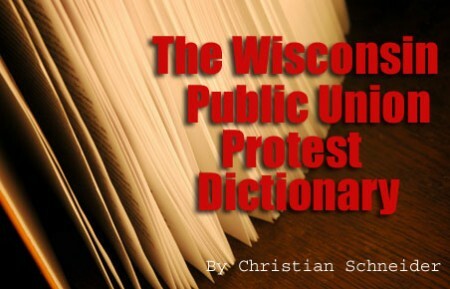 So when listening to politicians debate Governor Scott Walker’s plan to force greater public sector union contributions to their own health and pension benefits, it may be getting hard to understand – and not just because of the funny Wisconsin accents. “Democracy” – Traditionally described the process of people electing individuals to office, and those officials voting on their constituents’ behalf in the state legislature. Now refers to elected officials fleeing the state in order to avoid voting. In order to test the veracity of this new definition, you are encouraged to sit on your couch all weekend with a sign that says “this is what mowing the lawn looks like.” If your wife agrees, she is likely in the Wisconsin Capitol rotunda holding up a sign. “Hosni Mubarak” – Little known dictator of some country somewhere in the Middle East. But his thugs beat up Anderson Cooper just a couple of weeks ago, so that’s probably enough to compare him to Wisconsin Governor Scott Walker. “Debate” – The process by which people who disagree get together, voice their differences, and compare each other to Hitler while wearing fanny packs. Wisconsin protesters have drawn inspiration from the historical Lincoln-Douglas debates, when Lincoln famously dressed up like a gorilla and banged a drum for eleven days to annoy Douglas into submission. “Free Speech” – Commonly afforded individuals to express their political beliefs, “free speech” is now afforded to anyone who doesn’t work for Fox News, is interviewed by Fox News, has ever watched Fox News, or has ever admired the work of Michael J. Fox. “Dictator” – Refers to either a genocidal despot or a duly elected governor acting in concert with elected members of two houses to affect changes in the law. The two are interchangeable. “Middle Class” –Walker’s budget repair bill is a concerted effort to destroy Wisconsin’s middle class, as it is comprised entirely of individuals who work for government. Needless to say, it will be devastating to the state’s economy to ask more of the middle class – most notably, University of Wisconsin Madison professors who make $111,000 for working nine months out of the year. “Stifling Debate” – The parliamentary procedure of allowing testimony of 900 citizens over the span of 17 hours, then letting the minority party members that haven’t fled the state talk for over 60 hours straight in order to hold up a bill’s passage. “God-Given Right” – Any law change beneficial to Wisconsin government workers granted after 1959. In most cases, these rights are not granted to federal workers living in Wisconsin, so it appears many of them need to spend more time in church. Unfortunately, the one term nobody will be using any time soon in the state senate is “the ayes have it.” As a result, a lot of government workers will soon be learning what “unemployment compensation” is.